CARBONDALE, I.L. -- The University at Buffalo men's basketball team passed its first test as a nationally-ranked program, defeating a solid Southern Illinois squad, 62-53, at SIU Arena on Monday night. It was the Bulls' first game since being ranked 25th in the latest Associated Press poll. Buffalo closed the first half on an 11-0 scoring run to turn a 27-20 deficit into a 31-27 lead at the break. The Bulls never trailed the rest of the way. 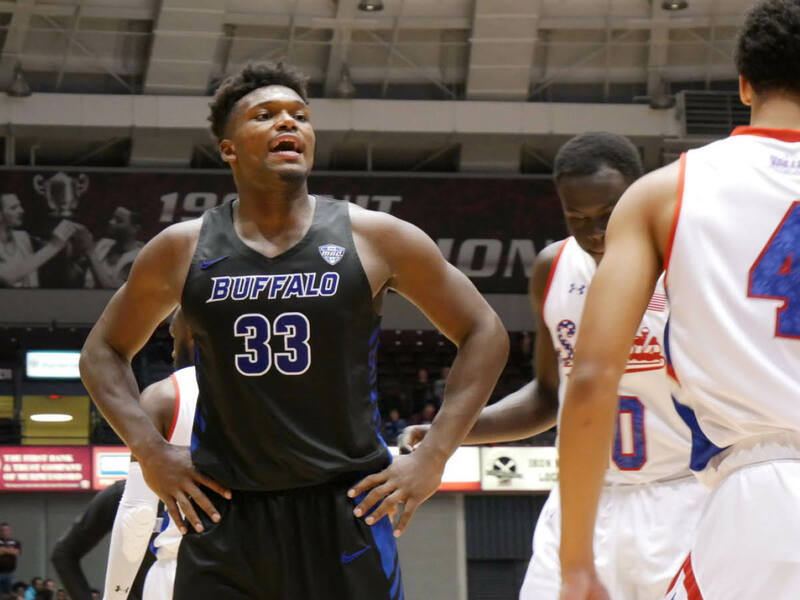 Leading, 45-40, midway through the second half, the Bulls began to pull away when Davonta Jordan drained a corner three-pointer, followed by a Montell McRae corner three to extend the UB lead to 51-41. Buffalo really clamped down on defense late in the game. The Salukis scored only four points over a nearly eight-minute stretch to allow the Bulls to build their lead to 60-43. Buffalo forced 19 SIU turnovers in the game. McRae and Jeremy Harris shared top scoring honors with 11 points apiece. Jordan added nine points and five assists. Nick Perkins had seven points and a game-high 11 rebounds. As a team, the Bulls outrebounded the Salukis, 41-33, including 17 offensive rebounds. "That was a tough environment to get a win in," head coach Nate Oats said. "I couldn't be prouder of our guys on this road trip. We kind of out-toughed them a little bit. They're a really good team, but we got on the glass, created some second-chance points and manufactured some points to grind out a win." With the win, the Bulls improved to 3-0 for the first time since the 1986-87 season. UB will next host Dartmouth on November 21 at Alumni Arena.